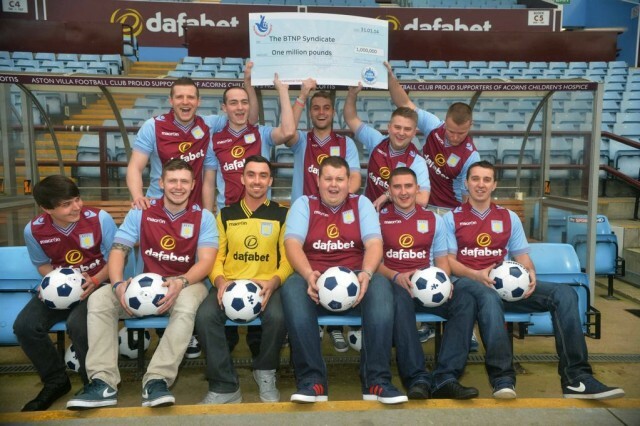 A £1 million EuroMillions jackpot has been won by an Aston Villa supporters syndicate of eleven friends, aged between 21 and 25. The group have known each other since their school days. The friends’ syndicate is named “Bigger Than Normal Peeps” (BTNP), which is an in-joke among the group and one they couldn’t be drawn on to divulge the details of. Each member will be taking home winnings of £90,909 – quite a pretty sum to start the year off with! The group had been playing a set of 11 lines for each draw since September 2013 and they finally managed to match the numbers and letters in the Friday Night Millionaire’s Raffle. On receiving the text message with the lottery draw results, they dismissed it thinking it was just a couple of Pounds, but on checking they were astounded to find they had won the £1 million jackpot. 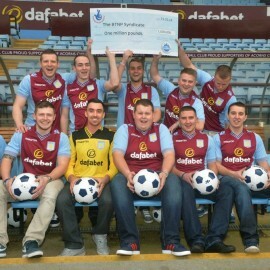 It took a bit of convincing before all the members actually believed that they had just won the jackpot payout. Most of the group are now looking to help out some family and friends, spend a bit on travel and put some away in an investment or two. We wish them all the best and hope they spend their winnings wisely – apart from looking at getting a luxury box for the next Aston Villa game perhaps.